Lines and odds at the Borgata emanate from MGM Resorts in Las Vegas. Las Vegas has been the only legal home of sports betting in the United States for many sports fans. That’s starting to change as other states start to legalize sports gambling. There are already more opportunities for sports fans and bettors to get down legal sports bets on single games around the country and there will be even more in the future. Betting expansion might keep some people away from Las Vegas. Some will stay local to keep expenses down because, after all, the money saved in travel is money you can bet with. Other gamblers will decide to place their $20 futures bet locally instead of on their visit to Sin City. Delaware was the first state outside of Nevada to offer sports betting at three of their racetracks. While they may have been first, Delaware isn’t the most attractive place for a gambling vacation. More recently, New Jersey legalized sports gambling. Racetracks fill a need to have a place for a one-off night of sports betting, but casinos can fill a week or weekend with activities for a vacation or just a weekend away from home. The Borgata was the first casino in Atlantic City to take a sports bet. They flipped the old racebook into a race and sports book so they could take wagers ASAP. The MGM Resorts operated casino is in the process of building a new sportsbook which should open in time for football season. Lines and odds at the Borgata emanate from MGM Resorts in Las Vegas. While MGM Resorts is the first Las Vegas casino operator to offer sports betting in New Jersey, they won’t be the last. Caesars Entertainment operates Bally’s, Harrah’s, and Caesars while the Golden Nugget also operates a casino in Atlantic City. Each of these casinos will offer sports betting in the future. A great way to get to Las Vegas is by earning comps and discounts when you spend money in a casino. Each of these casino operators has a player's club that allows guests to earn and use comps and rewards at both Atlantic City and Las Vegas properties with a linked players club. Each of these casino companies operate in other states but they haven’t legalized sports betting...yet. M Life Rewards offers tier points, comps, and express comps for almost every dollar spent in their casinos. They offer express comps ($100 wagered for $1 ExpressComp) for the racebook. 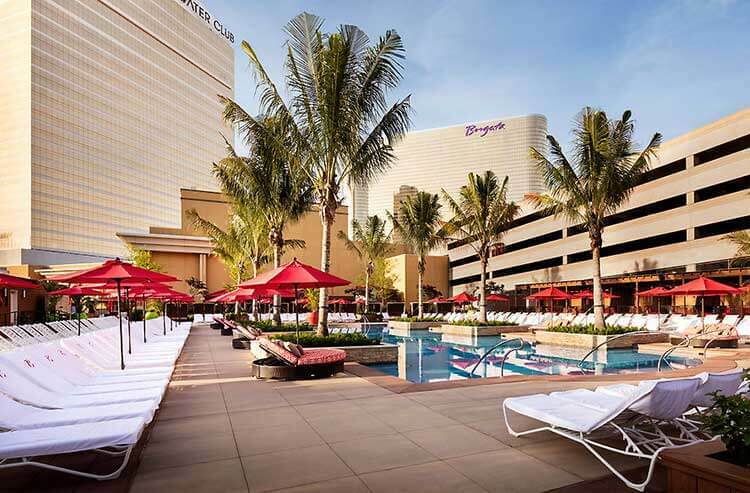 You can still earn and use M Life Rewards comp dollars and tier credits points everywhere else at the Borgata, MGM National Harbor (Maryland) and all Las Vegas properties. Unfortunately, M Life Rewards doesn’t offer comps or points for sports bets in the Nevada casinos so there's a good chance we won't see them offered at Borgata. You can learn more about M Life Rewards here. While the Golden Nugget has a national casino players club it isn't as developed as the others listed already. The 24K Select Club only offers points and credits when gambling. That said, you can still earn and use rewards all around the country. The FAQ on the 24K Select page is helpful. Read it here. These aren't the only casinos in Atlantic City that will offer sports betting. They're just the properties with a casino player's club that link to Sin City. William Hill will operate the sportsbook at Ocean Club when it opens in late June. Resorts Casino has an interesting sports betting partnership with Draftkings. Their internet gaming area will be the site of the sports book but plans haven't been released just yet for when it will open.